Any tile that is more or less identical can use the same geometry and texture map, which further reduces the size needed to represent the world as a whole. In explanation of the engine presented here this text also provides background information on general scrolling theory and in particular the isometric perspective as appropriate, along with what is intended to be an informative literature review of recent relevant material. In addition this engine is presented with the background isometric code-base that was used to design a similar engine in a completely 2D environment, as a point of reference for developers hoping to adapt existing 2D solutions to more robust 3D environments. Collision detection, path-finding algorithms, and path culling are also discussed as appropriate. Both of these engines are presented in a primarily unoptimized form to aid in ease of understanding. Optimized versions of the same engines will be made publicly available. Sample Director 8.5 movie source is available for download in ZIP or SIT archive format (both files are approximately 1.2MB). If you have Shockwave 8.5, you can view the end result (~185K). To explore what a 3D scrolling world engine does, the first thing to do is to examine one so that one can have a frame of reference as to the type of environment that is being simulated. To begin, open the 3DISO.dir file from the download, and start the movie. After a few moments of initialization and terrain generation, you should see something similar to the screenshot below (see figure 1). Use the forward (up) arrow key to move the character (represented in early versions of this work as an untextured cube) around the world, and press the right and left arrow keys to spin (pressing the right and up key simultaneously will bank right, and the left and up arrow combination will bank left). Also, use the q character key to cycle through the rendering modes. Pay special attention to the wireframe mode, as this is the mode that essentially gives away the illusion with regard to the inner workings of the engine. 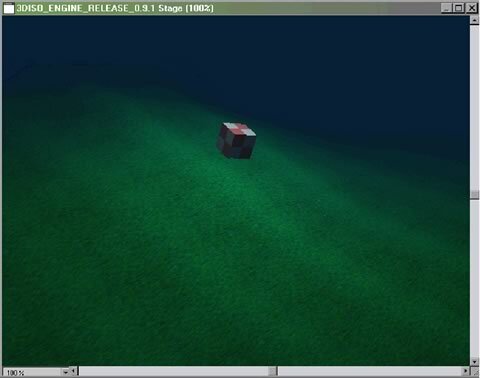 The earlier isometric engine is available as a Director 8.5 movie source in ZIP (1,0MB) or SIT (1.2MB) archive format. Figure 1: 3DISO Engine in action.